Sophia’s parents, Joseph and Josephine Rudziñska Truszkowski, who were very devout, instilled in their first child those virtues of piety, social justice and charity that were reflected in their own exemplary lives as loving parents, devout Catholics, and loyal citizens of this world.From her earliest childhood Sophie distinguished herself with unusual sensitivity for human misery and poverty and gave to the poor every penny that came into her hands. Recognizing Sophia’s sharp intellect and avid curiosity, Joseph Truszkowski was determined to provide their eldest daughter with the best education and cultural upbringing without endangering her frail health. The intensity with which Sophia approached her studies and life situations, however, drained her energies and weakened her health to the extent that she contracted tuberculosis when she was sixteen years old. The family physician recommended that a rest in Switzerland would restore her health. Accompanied by Mrs. Kotowicz who had continued to live with the Truszkowski family even after Sophia had gone on to the boarding school, Sophia spent a year in Switzerland. Sophia returned to Warszawa more dignified and mature and left the boarding school permanently in order to study privately at home. With access to her father’s vast library collection, she continued her study of Latin and her already fluent knowledge of French. She also pursued studies in contemporary philosophy, ethics, and social thought. Gifted with a keen mind, a formal classical education and a profound insight into contemporary social problems that reflected her personal study, her father’s professional experience and the familial atmosphere of openness, Sophia’s delicate soul was also enhanced by the development of a solid spirituality supported by a deep prayer life and spiritual direction. Attracted to a life of contemplative prayer, Sophia eventually told her parents that she wished to become a Visitation nun. Her plans were delayed, however, when her father took ill and was advised to seek a health cure in Salzbrunn. As the oldest in the family, Sophia was required to accompany her father to Germany. It was in the Cathedral of Cologne during an unforgettable prayer experience that Sophia first began to realize her real vocation in life as she clearly discerned that God was not calling her to be a Visitation nun. Following her return to Warszawa, Sophia resumed her normal routine of daily activities and duties while continuing to look after her sick father. Assuring him that she would remain with him until his death, she discarded her earlier thoughts of becoming a Visitation nun and resumed her works of charity. The dimensions of Sophia’s charism began to fall into place. Her gifts of nature and grace and her steadily increasing service to the Church in the personhood of the poor and neglected increased Sophia ’s involvement in Christ’s gospel message of discipleship. Sophia was joined in her work by her cousin and closest friend, Clothilde Ciechanowska. Later that year both young women became lay members in the Franciscan Third Order under the direction of Father Honorat Kozminski at the Capuchin monastery in Warszawa. After only a short time the increasing number of women and children she was caring for made it necessary for Sophia to transfer the Institute of Miss Truszkowska to larger quarters. Sophia and Clothilde left their homes then to take up residence at the Institute. 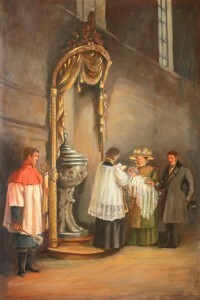 Here, before an icon of Our Lady of Czestochowa, on the feast of the Presentation of the Blessed Virgin Mary, November 21, 1855 , Sophia, who was known by her lay tertiary name of Angela, and Clothilde who was known as Veronica, solemnly dedicated themselves to do the will of her Son, Jesus Christ, in all things. Hereafter, this was recorded as the official founding day of the Congregation of the Sisters of St. Felix of Cantalice. 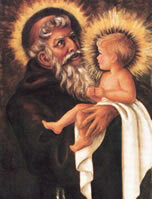 When Sophia, however, was seen leading the children to the nearby Capuchin church to pray at the shrine of St. Felix of Cantalice, people began calling them “children of St. Felix.” Although Sophia and the other young women, who later joined her, wore no religious habit at the time, the people called them “Sisters of St. Felix.” They were popularly referred to as “Felician Sisters,” the name by which the community is still known. After observing these young women and the good work they were accomplishing, Father Benjamin Szymanski, provincial minister of the Capuchins, seriously considered the prospect of their becoming a religious community in the Church and appointed Father Kozminski, as director of the institute with the added responsibility of formulating a rule of life for these young women. When the Institute of Miss Truszkowska took its new place in the Church as a religious community in formation, Angela realized her vocation and her life’s destiny in God’s plans. Her natural gifts, family upbringing, education, qualities of leadership and organizational skills found expression in her role as superior general of the fledgling community. Her deep prayer life, personal holiness, and compassionate concern for others became the hallmark of her role as spiritual mother. Her dedication and clarity of vision attracted newcomers and inspired those who had already joined her ranks. Through her life, work, and personal holiness, she forged the role and destiny of Poland’s first active-contemplative community of religious women. This new community was unique to traditional religious life in Poland. Her Felicians were innovative in organization, leadership, and in service oriented roles in their homeland and in mission fields. During these earliest years, Angela was elected superior general of the Congregation for three successive terms. The multitude of responsibilities and unending challenges, trials and difficulties, which she endured, as well as serious health problems, prompted the Foundress to withdraw from administration of the Congregation in 1869. She was forty-four years old then and was destined to live in the background for the next thirty years. 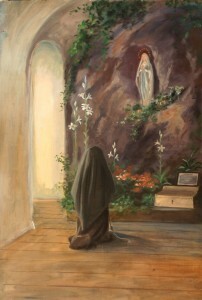 The longest period in the life of the Foundress, these were years of prayer, work, and suffering. She endured a progressive loss of hearing, which seriously hindered her working relationships as superior general, her discussions during spiritual conferences and ordinary conversations in community. Excruciating headaches and malignant tumors also took a toll on her and restricted her active involvement in community affairs. Mother Angela accepted ministry assignments in the garden and greenhouse, tending flowers for the chapel and in the liturgical vestment sewing room, embroidering altar cloths and chasubles. Every aspect of Mother Angela’s life and service reflected her grace as foundress and spiritual mother. Her concern for the sisters remained very much alive even in her most pain-filled moments. On April 18, 1993, Mother Angela joined the company of the Blessed during the Mass of Beatification in St. Peter’s Piazza, Vatican City.